Heroes « What's a Girl to Do? Amid all the (well deserved) hoopla over Shakespeare’s forthcoming 450th birthday I’d like to celebrate another birth anniversary. 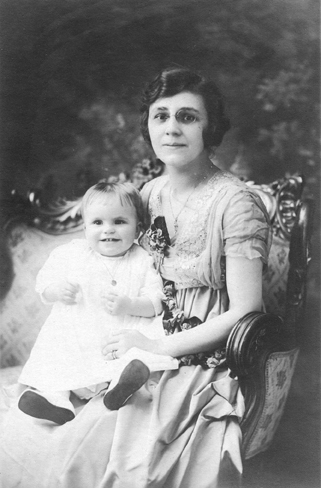 Today my maternal grandmother, Clara Engel Hallett, would have turned 125. According to her gravestone in Clyde, New York, she isn’t actually dead. She purchased it at the time of my grandfather’s death in 1966 and had the stone carver inscribe the dates “1889-19__” on it. Somehow or other our family never got around to having those last two numbers filled in after her death in 1988. So she seems to live on, although she is forever trapped in the 20th century. 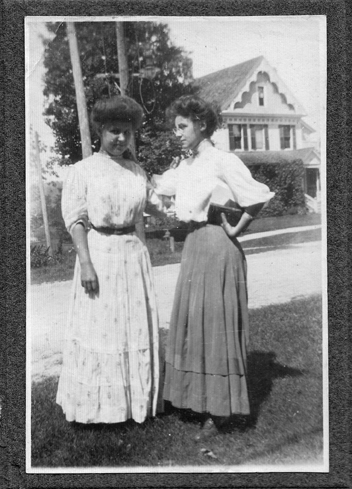 I have written a lot about my grandmother over the years, mostly focusing on her Horatio-Alger like childhood. She was adopted by a miserly farmer and suffered in his home for years, only to be rescued by a kind, childless couple who gave her love and an education. She was frugal, dignified, beautiful, and loyal to friends and relatives. She was generally subservient to my grandfather. On one notable occasion, however, she stood up to him. One evening Hal was trying to teach his eldest child, my mother, the multiplication tables. My grandfather had many wonderful qualities, but he was often a bully. He yelled when little Janice got one of her answers wrong, and the child panicked and started guessing randomly. Her father shot up out of his chair and advanced on her, apparently thinking that a good spanking would teach her arithmetic once and for all. Meek Clara swooped across the room, picked up her daughter, and glared at her husband. “Don’t you touch a hair on that child’s head!” she announced fiercely. Neither my grandfather nor my mother ever forgot that moment. Despite his bouts of temper Clara was devoted to Hal. One of my favorite stories about her demonstrates her loyalty to him—and the romantic streak she sometimes tried to hide. She related it to me one evening when I was in my early 20s and was staying at her home for a few days. 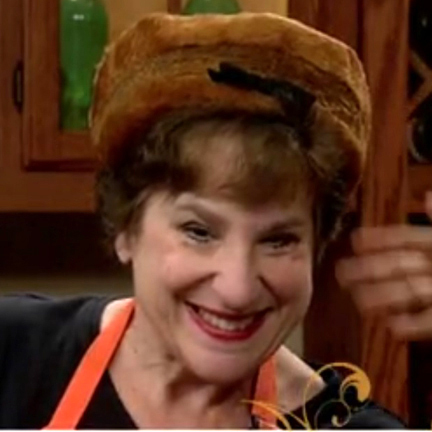 She was probably under the influence of the single old-fashioned cocktail she allowed herself at dinnertime. Early in her marriage, she told me, my grandfather brought a business associate home to dinner. When she shook hands with this mysterious stranger, she felt a palpable electric shock of attraction. She spent most of dinner trying to avoid his gaze. At the end of the evening, as the associate took the train home, she informed my grandfather that she hadn’t liked the man and never wanted him invited to her home again. She valued her marriage far too much to chance another meeting, she told me. For years she wondered what might have been. And then, at a party about 20 years later, she met her mystery man once more … only to find him old and boring. She admitted to me that it was possible that he had been boring all along. Maybe the carpet was responsible for the electric shock. In any case, she had enjoyed her little romantic dream but was pragmatic enough to appreciate its demise as well. Another romantic dream ALMOST came back to her late in life when, after my grandfather’s death, she received a letter from her childhood beau in Rutland, Vermont. In their teenage years she had called him King Arthur. He had called her his Guinevere. Late at night she had daringly lowered homemade fudge down to him from her bedroom window using her corset strings. Arthur wrote in 1968 or so to tell my grandmother that his wife had died and that he would like to rekindle their relationship, then dormant for about 60 years. She appreciated the note but wasn’t ready to shackle herself to a man again. 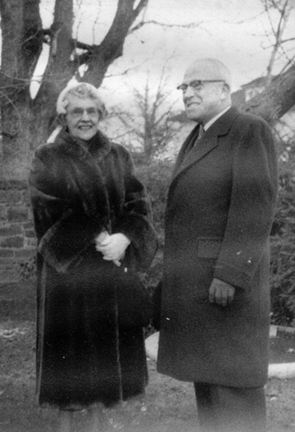 After my grandfather’s death she had discovered a new sense of freedom and self-reliance, redecorating the house and trading in my grandfather’s big white Cadillac (he had purchased a new Cadillac religiously every two years) for a big white Oldsmobile. Personally, I found the two cars almost identical, but to her that Oldsmobile symbolized her new position in the driver’s seat of her life. So she wrote to King Arthur and said that although she would always treasure his memory, she preferred that he remain just that, a memory. And she got on with her life. Thinking of her combined romanticism and pragmatism always makes me smile, particularly on her birthday. I recently spent 24 hours in New York City. 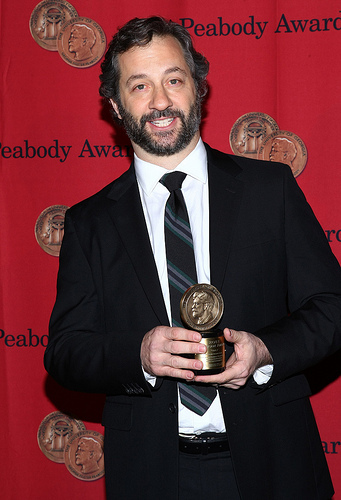 My main purpose was to attend the Peabody Award luncheon on Monday, May 20. 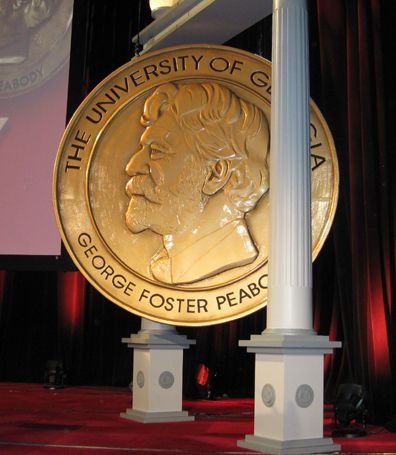 The Peabodys, administered through the University of Georgia, were originally founded to honor excellence in radio. Now they encompass all forms of electronic communications. 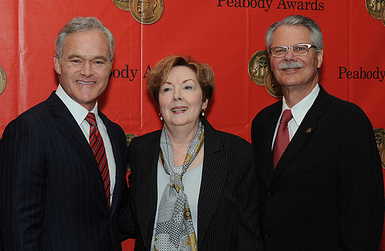 I wish I could tell you that I went to the Peabodys to accept an award! Not yet. I went because this year is the final one in which my former graduate-school professor, Horace Newcomb, will serve as the director of the Peabodys. Once he moves back from Athens, Georgia, to his home in Austin, Texas (and stops making Peabody-related trips to New York City), I’ll be unlikely to see him. So I decided to attend the ceremonies, to which Horace has invited me every year for more than a decade. I knew I wouldn’t have a lot of time to talk to Horace or his wife, Sara, in the hubbub of awards, congratulations, and food. I didn’t. But I wanted to talk to them one last time. I did. My father always said that if one is truly lucky in higher education one will find at least one professor who really matters, who teaches one to think and encourages one to do one’s best work. For me, Horace was one of those professors. He is pretty much the founder of television studies in the United States. He began by teaching in an English department, in fact, since early in his career few official departments existed in which one could study or teach television. 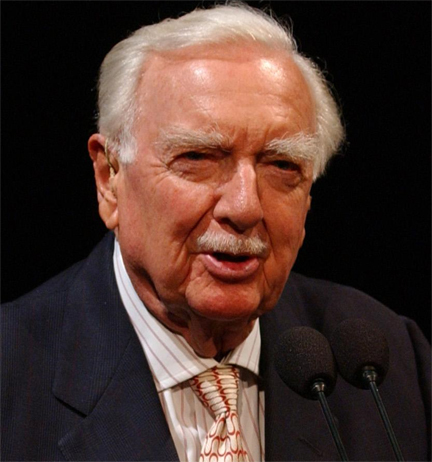 By the time I got to the University of Texas, where I got my Ph.D. in American studies but specialized in media history, he was a well known figure in the university’s Radio-TV-Film department. I wasn’t Horace’s best or even favorite student. He was always generous with his time, however. He inspired me to hone my writing and my analysis of stories told in any medium. And he occasionally talked me down from the metaphorical ledge when I was feeling stressed out by life as a Ph.D. candidate. When I decided to ask outside readers to give an honest appraisal of my new memoir, Pulling Taffy, Horace was one of the few people to whom I sent the manuscript. He offered insightful suggestions for reshaping the book. I didn’t implement them all, but they set me on the path I ended up taking. I was happy to hand a copy of the book to him and Sara after the Peabody luncheon. I was also happy just to be there for the awards, which went to a remarkable bunch of people and radio/TV/web productions. Some of these (Lorne Michaels, HBO, Doctor Who) were known to me. Others were new. These included Filipinos who had created a video exposé of child malnutrition in their country and a Phoenix news station crew whose in-depth reporting on the cause of a local automobile accident eventually led to a federal inquiry and the recall of hundreds of thousands of vehicles. I left with a happy feeling from having encountered Horace and Sara; a few celebrities (I saved a departing elevator for Judd Apatow! ); the glorious art-deco palace that is the Waldorf Astoria Hotel; and the hustle and bustle of New York, which always invigorates me. I also left with a piece of chocolate shaped like a Peabody Award and a bouquet of aromatic flowers that survived the bus ride back to Massachusetts and graced my table here for more than a week. Most importantly, I left with inspiration. All the people accepting Peabody Awards were passionate about their work, and all of them had told stories that mattered. I hope that my next big story will matter, too. I’m not sure what that story will be, of course; I’m running around like a crazy person publicizing my current book! But I’m cogitating. Stay tuned….